Research has shown that certain stores are more prone to robberies and injuries than others, that some stores are more vulnerable than others, that they are more frequently targeted than others. Why is that? Research-based evidence has exposed a causal connection between environmental influences and robberies. Results revealed the top three most important factors to criminals in making the final choice to rob a specific store location was 1) the amount of money they could obtain, 2) having an easy escape route, and 3) keeping their anonymity—in other words, remaining unknown. Criminals do not want to get caught; they want to get in and out quickly without being seen and would prefer to work behind closed doors, or in this case, behind cluttered windows where they can hide. Keeping a clear sight line by removing window signage and placing the cash handling area in clear view of the outside has been shown to deter robberies for this exact reason. 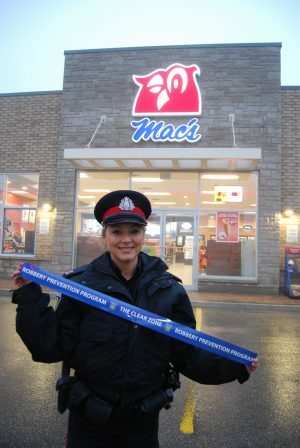 As a result of this research, some police services, such as Peel Regional Police, which is responsible for policing the cities of Brampton and Mississauga (Ontario, Canada), and leading convenience store (c-store) chains, such as Mac’s convenience stores, have instituted specific robbery prevention strategies similar to the Clear Zone Robbery Prevention Program, which is the focus of this post. The concept of Clear Zone was developed by Cst. Tom McKay, who has been in the Peel Police crime prevention unit over the last 25+ years. Cst. McKay, who retired in May 2017, has been a top specialist in Canada for crime prevention through environmental design (pronounced “sep-ted,” better known as CPTED) and has been recognized for being an expert by the Police Executive Research Forum on Crime Prevention in Washington, DC. 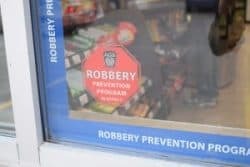 The Clear Zone Robbery Prevention Program was designed in 2010 to discourage convenience store robberies by using research-based evidence influences. With support from the Peel crime prevention team, the program was successfully rolled out across the Region in 2014. So what exactly is The Clear Zone Robbery Prevention Program? As mentioned, window signage has historically been an issue in the c-store/gas industry, with it being identified as a causal factor for robberies in numerous studies. Many store owners often place promotional material in the windows, not realizing they are providing cover for potential criminals to commit their crimes without being seen. Signage and promotional material over time may collect in the windows, obstructing the view from both inside and outside the store, thus providing the perfect cover for criminals to stay hidden. The Clear Zone Robbery Prevention Program was developed to reduce convenience store and gas station robberies through the implementation of an innovative “Clear Zone” window decal. This decal is intended to discourage robbers by creating a visually impactful “window within a window” that is strategically placed to increase witness potential while also putting the robber “on stage.” The decal further serves as a reminder to store owners to keep the window free of signage and the area clutter free. How does the program work? The Clear Zone program works by identifying a prominent window that strategically overlooks the cash handling area. It is imperative that the window is directly in front of, or closest to, the sales counter area and is kept free of signage and clutter. For instance, shelving gondolas with merchandise stacked against the windows or display units will effectively block the view and should be removed. This area is chosen because the majority of transactions, including robberies, take place at the sales counter. Once this window is identified, it is highlighted and defined through the application of the blue Clear Zone decal around the window. Having the Peel Regional Police logo directly on the decal, along with the printed words “Robbery Prevention Program,” fosters a sense of police presence and acts as a visual deterrent to criminals. Ultimately, the program strives to deter criminals from targeting the store location altogether because of the inherent risks of getting caught. This is done by stripping away their anonymity in the Clear Zone. In the event that a robbery does occur, a clear line of sight will dramatically increase the ability of passersby in the parking lot or street to see what is happening inside the store; it may prompt them to phone the police, if needed. Increasing the possibility of witnesses and the likelihood of identifying the suspect are what’s gained here. Many criminals are often repeat offenders and, by identifying these individuals, police increase their chances of stopping them and preventing other robberies from occurring in the future. In the Peel Region, the Clear Zone Robbery Prevention Program is offered as part of the Robbery Prevention and Survival Kit, which is available free of charge to businesses that are located in the Cities of Brampton and Mississauga. Once contacted, a Crime Prevention officer will attend the store location to conduct a security assessment and to install the materials. The kit contains a number of resources and decals that will help to discourage and/or deal with a robbery, in the event that one occurs. Like most police organizations, the Crime Prevention Services unit at Peel Regional Police is the research and policy center for prevention programs and crime reduction strategies. By researching crime trends in the region, the unit aims to proactively offer programs and education to support citizens and commercial businesses in protecting their families, homes and workplace, in order to promote the highest level of community safety. The Peel Regional Police organization is dedicated to preventing crimes from happening in the first place, or, at least, minimizing crimes as much as possible by working together with all stakeholders. Recognizing the importance of working together with the community, Crime Stoppers, and law enforcement to help stop, solve and prevent crime against retailers, Mac’s convenience stores became the first convenience store chain to partner with Peel Regional Police, implementing The Clear Zone Program in all its store locations across Peel Region. Maintaining a safe and secure environment for their customers and employees through proactive measures is their foremost concern. Shortly after Mac’s introduced the Clear Zone program, indications showed the program was contributing to a downward trend in the overall incidents of crime at their Peel Region locations by more than 41 percent. Having these measurable results, Sportun expanded the program into five other locations in Ontario (Ottawa, Toronto, and Thunder Bay) to further gauge the success of the program in those markets. Mac’s rebranded the wording on the Peel Regional Police Clear Zone decal, renaming it the “Clear Zone Community Safety Program” (which included the company’s Mac’s Crime Busters logo) and then introduced the concept into the identified locations outside Peel Region in January 2015. What’s great about the Clear Zone program is the concept behind how and why it works; any store operator can take these easy-to-use suggestions to improve safety in their own locations. Try evaluating the security of your own store by looking and walking around to see what you see—or, more importantly, what you don’t see. Can the cash handling area be viewed through the windows? Note where you need improvements and can make changes. Information that can improve safety should be shared among all communities; for that reason, it will truly benefit everyone to work together, share information, and help others in the industry who may want to strengthen their security programs. This program is not meant to be a robbery-proof solution, but is intended to be shared as an added layer of security to reduce the chances of you becoming a victim of crime. The Clear Zone program is currently expanding in Peel Region to other retailer establishments, such as pharmacies, pizza restaurants, cash advance stores and other locations that can benefit from this program. It is through engaged partnerships, meaningful collaboration and relevant outcomes that we can all benefit together. Crime prevention is a shared responsibility between the community and the police. For more information, visit peelpolice.ca/TheClearZone. 1) Provide all staff with robbery prevention training. Provide periodic reviews. 2) Reduce the amount of cash on hand. 3) Make frequent cash drops. 4) Post Limited Cash on Hand decal, Height Chart, & Robbery Prevention Program in effect decals where appropriate. 5) Install a drop safe. 6) Ensure the video surveillance system is working properly. 7) Provide/maintain sufficient amount of light internally and externally. 8) Remove all excessive window signage/clutter from the sales area and other critical lines of sight. 9) Watch for and report suspicious activity. 10) Greet and make eye contact with all customers. 11) Try to remain calm and comply with the robber. 12) Tell the robber everything you are going to do. 13) Give ONLY what you are asked for. 14) Try to note at least one distinguishing characteristic of the robber, surfaces touched, weapon description, and direction of travel. 15) Don’t assume there is no weapon. 16) Don’t argue, resist, fight, or use a weapon. 17) Don’t make sudden movements. This post was originally published in 2017 and was updated May 10, 2018.